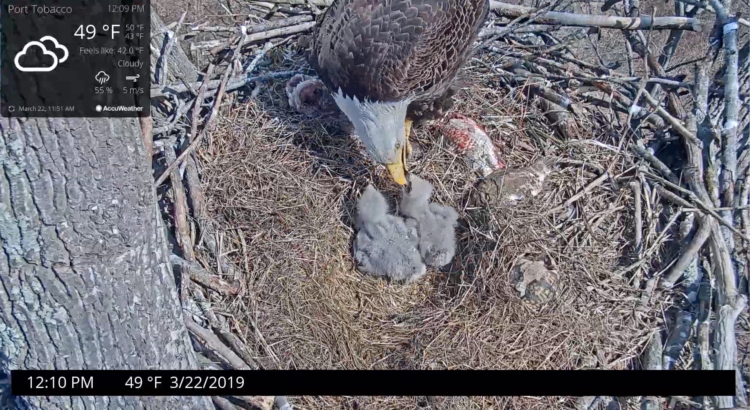 Port Tobacco eagles Chandler and Hope have two hungry eaglets, hatched on March 10 and March 12. The third egg did not hatch. Bald eagles fledge at about 10 to 14 weeks of age. Until then, Chandler and Hope will have a lot of work to do keeping the eaglets fed. You can watch the Port Tobacco Eagle Cam from our home page. The Port Tobacco Eagles Have Hatched Their First Eaglet!